One of the main accusations of environmental organisations against hydroelectric power stations is that they do not ensure the safe migration of adult fish after spawning and that of fry down the river to the sea. Fish migrating down the river can be killed or injured in turbine chambers by rotors, sudden changes in pressure, water velocity or cavitation. 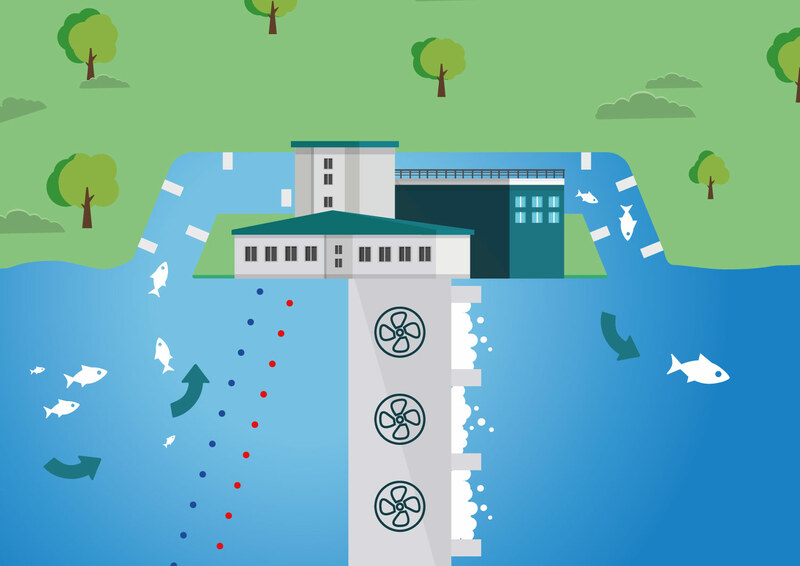 The use of mechanical grille protection on turbine inlets (so called dense grids with a clearance of up to 2 mm) can effectively limit fish access to turbines. However, due to the high water velocities which occur at the grids themselves, it will not protect fish from the push effect on the grids. This phenomenon most often leads to the death of fish. Therefore, the use of grilles on inlets for hydropower turbines is not sufficient, but additional safeguards need to be considered. Such an additional safeguard is the NEPTUN system, which discourages fish from entering the turbines of hydroelectric power plants, and additionally, if appropriately installed, directs fish to a fish pass or other safe area. The NEPTUN system consists of positive and negative electrodes, which are attached to the bottom in a flexible manner and between which an appropriate electric field is generated. The electrodes are installed at such a distance from the inlets to hydroelectric power plants that the fish have the time and power to react to the field acting on them. Thanks to such an approach and appropriate design of the NEPTUN installation, the system achieves a very high efficiency in blocking and possible directing fish e. g. to the fish pass. Using the NEPTUN system we limit access to fish to an area that can be dangerous for them. This allows us to reduce the amount of fish that may be damaged and minimize the risk of depopulation. By using the NEPTUN system, the user shows that he takes care of the environment. It builds the image of an ecological company and provides an additional argument when applying for all environmental permits from state institutions.